Find the perfect spot where sky meets ocean, and ocean meets pool - and enjoy. If you had your own beach place, you'd want it to look a little something like this. Got an hour to spare? You know what to do. The treatments all sound equally amazing - just point at a few and go for it. Located on a serene golden sand beach. With two poolside bars, you can unwind with a drink wherever you want. Nestled between cliff and sea, the Grand Solmar Land’s End Resort and Spa is nothing short of breathtaking. Seven infinity-edge pools maximize the stunning setting in a way that photos can’t quite capture, but you’ll snap a couple hundred anyway – it’s impossible not to. Unwind with a delicious beverage at one of the two swim-up bars. When it’s time for lunch, enjoy poolside dining at the Sunset or Sunrise pools. The breezy Sea Spa Cabanas at the full-service spa promise beachfront massage treatments under private white canvas canopies. While the little ones are occupied in the children’s club, head for the state-of-the-art fitness center. Get the most from your workout by hiring a personal trainer. With all of this, it’s no wonder that the resort has a 5.0 Rating on TripAdvisor! Air-conditioned studio, one- and two-bedroom condos sleep four to six guests and have marble floors and countertops. Full kitchens give you the freedom to make your own meals, or dine at one of the four on-site high-end restaurants. Back in your condo, enjoy a low-key night in thanks to the flat screen TV with satellite cable. Gather the family on the couch, put one of the kids in charge of the remote and another in charge of snacks. Or opt out of TV night and lounge on your private balcony enjoying the spectacular ocean views. The last thing you want to do after a fun family vacation is laundry. Good news! The resort has on-site laundry facilities. Now all you have to do when you get home is unpack. 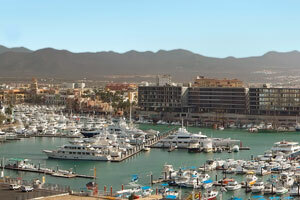 Grand Solmar is next to the Arch of Cabo San Lucas, a popular photo destination for tourists. This limestone arch was formed by tide, wind and time and is known by the locals as “El Arco”; on the oceanside is Playa del Divorcio and on the gulf side is Playa del Armor. Sailing, snorkeling, parasailing and dinner cruises are just some of the activities and tours available at the arch. For even more excitement, check out Cabo Adventures. They offer a variety of fun family adventures that everyone will love. Dolphin adventures include swim and ride experiences, a dolphin encounter, signature swim and even a special experience just for kids. Scuba dive at Land’s End and the Arch. Sea Adventures include snorkeling, whale watching, and luxury day sailing. Mountain biking, electric biking and the outback and camel safari are some of the Land Adventures offered.